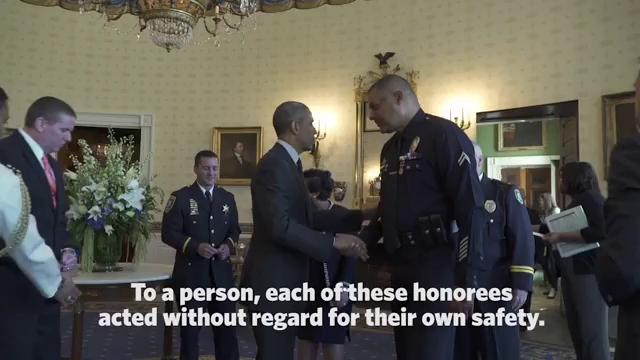 Officer Donald Thompson is awarded the Medal of Valor at the White House, May 16, 2016. Three Santa Monica, California, officers — Jason Salas, Robert Sparks and Capt. Raymond Bottenfield — were honored for their response to a 2013 rampage on a community college campus that left five people dead. Confronting 23-year-old gunman John Zawahri in the campus library, the officers shot and killed him when he pointed his assault weapon at them. Another of those honored, Police Maj. David Huff of Midwest City, Oklahoma, saved a 2-year-old girl being held at knifepoint after negotiations with her captor deteriorated. — Miami-Dade police Officer Mario Gutierrez, who was stabbed multiple times while subduing a knife-wielding man who tried to set off a massive gas explosion that could have caused massive casualties. — Johnson City, New York, Patrolman Louis Cioci, who chased and captured at a crowded hospital a gunman who had just killed a fellow officer. Investigators believe Cioci saved the lives of hospital staff, patients and visitors. — Los Angeles police Officer Donald Thompson for, while off duty, crossing two freeway dividers and braving first- and second-degree burns while pulling an unconscious man from a burning car to safety. — Omaha, Nebraska, police Officer Coral Walker, who shot and killed a man who had killed and injured multiple people during a shooting rampage. — North Miami, Florida, police Officer Niel Johnson, who endured gunfire from an assault weapon in pursuing and capturing a man who had shot a Miami police officer and two bystanders. — FBI Special Agent Tyler Call, who while off duty with his family helped rescue a woman whose ex-husband was holding her at gunpoint. — Niagara County, New York, sheriff’s Deputy Joey Tortorella, who confronted and subdued a gunman who had shot and wounded his parents inside their home, preventing the gunman from threatening the safety of students at a nearby elementary school. 1. What is the Medal of Valor? For what reasons is it awarded? 2. 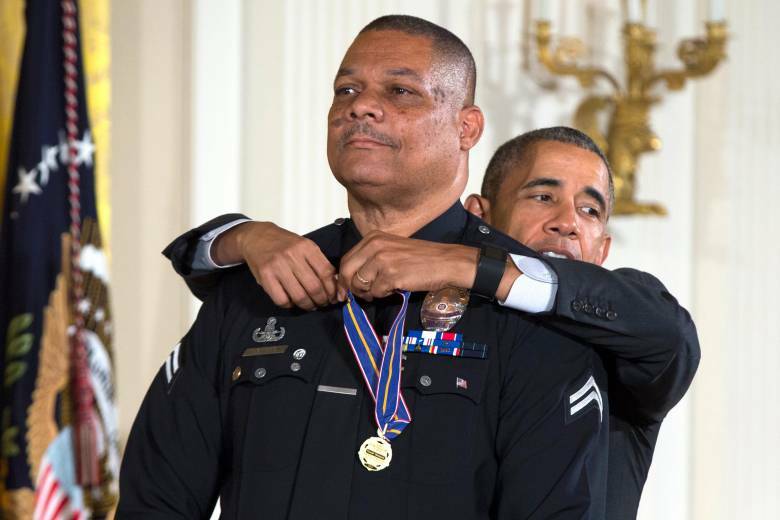 How many law enforcement officers were awarded the Medal of Valor at the White House this week? 3. List the names/cities of the recipients. 4. What did U.S. Attorney General Loretta Lynch say about law enforcement officers during the ceremony? 5. Read the stories of each individual. Which one most inspires you? Why? 6. Why is it important for us to honor our law enforcement officers? Every day, public safety officers risk their lives to protect America’s citizens and communities. To honor that commitment, Congress passed The Public Safety Officer Medal of Valor Act of 2001, which created the Public Safety Officer Medal of Valor, the highest national award for valor by a public safety officer. The medal is awarded annually by the President to public safety officers who have exhibited exceptional courage, regardless of personal safety, in the attempt to save or protect human life. A “public safety officer” is a person (living or deceased) who is serving or has served in a public agency, with or without compensation, as a firefighter; law enforcement officer, including a corrections, court, or civil defense officer; or emergency services officer, as determined by the U.S. Attorney General.